Palmistry reading is a method of counselling that originated in India over 3,000 years ago. It is a part of a vast field of study, referred to as Samudrik Shastra, which literally means the ocean of knowledge. Palmistry is a sub-section of this vast knowledge and deals specifically with the study of the hand and the imprints therein. Palmistry is an important science which tells us about the future very genuinely. Of, course there are the various branches of Astrology which predict the future course of an individual , but palmistry gets one step more in it the results are very clear and accurate. In the other branches of Astrology, the moment of birth is very important (which at times is not available to the individual concerned) but in Palmistry , it is the lines and mounts on one’s hand that hold the key to his future.The small, thick, thin and oblique lines, mounts and markings in the palm of a person have the whole future imprinted therein. Palmistry has and is contributing a lot to the medical and criminal/forensic sciences. 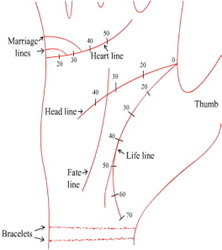 The diseases of a person can be easily recognized by an experienced Palmistry Reader and the finger imprints can be used to identify criminal cases. find your fate with HAND/PALM READING. Please go with PALMISTRY PREDICTION and FACE READING OPTION (NOTE : If you wanted to have prediction for your children or well-wishers in case in person get their photos).